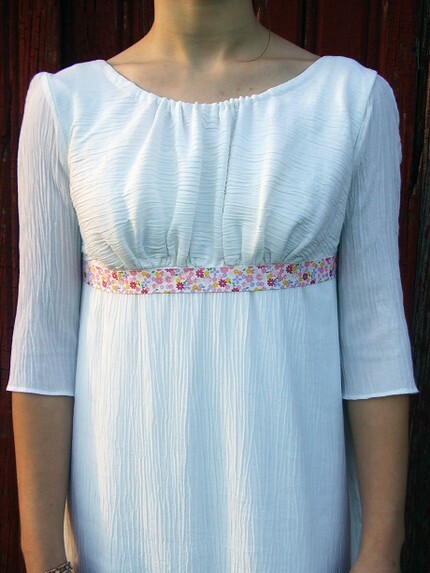 This lovely dress was inspired by Medieval Style Fashions. The fabric is a beautiful deep teal blue stretch velvet and dark chocolate brown linen. Neckline features bronze golden trim. Waist is accented with a metal belt featuring bronze details and rhinestones. Here is a costume I created for a customer who was looking for a lovely Renaissance Inspired Costume with her own ideas added to the look. So I worked off some sketches she sent me as well as colors we picked out together. 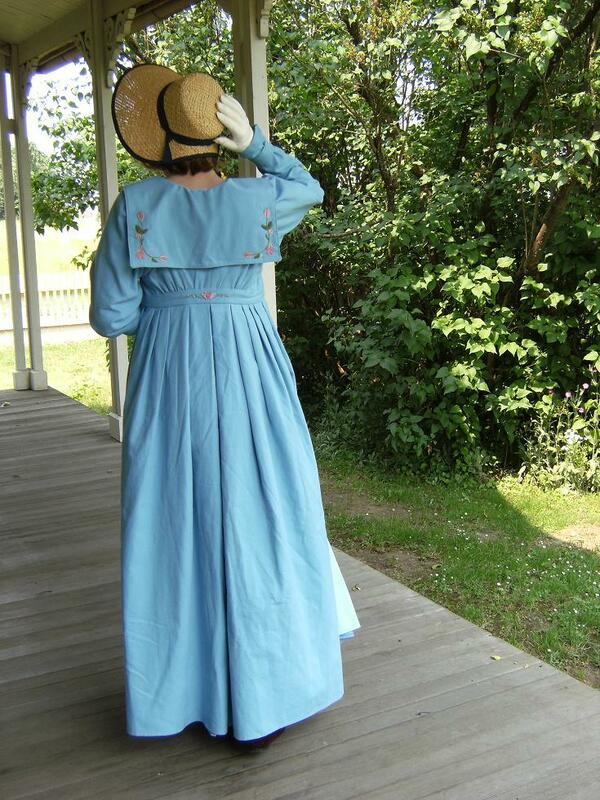 The costume includes a cotton shift/chemise, linen skirt, boned bodice and waist bag. It was really fun to bring her costume ideas to life. More details can be seen in the photos below. The blue boned bodice is a lovely silk brocade. Front laces with black cording and eyelets. Special thanks to my customer for sending in a photo of her wearing the costume. It looks amazing on her and the belt she added is so perfect for the look. This costume was inspired by historical colonial styles and Anna from the AMC TV Show Turn. 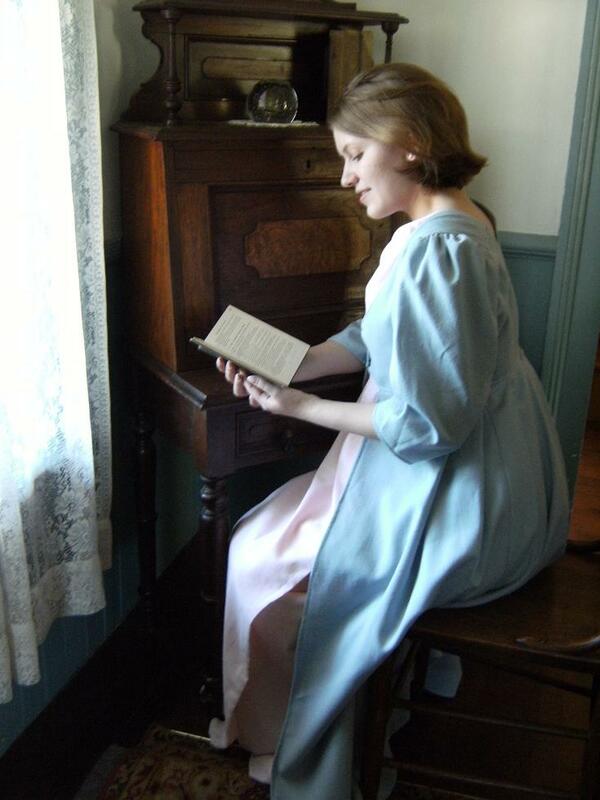 Costume includes chemise, petticoat, skirt, apron and stays. Fabrics are all cotton and linen blends. 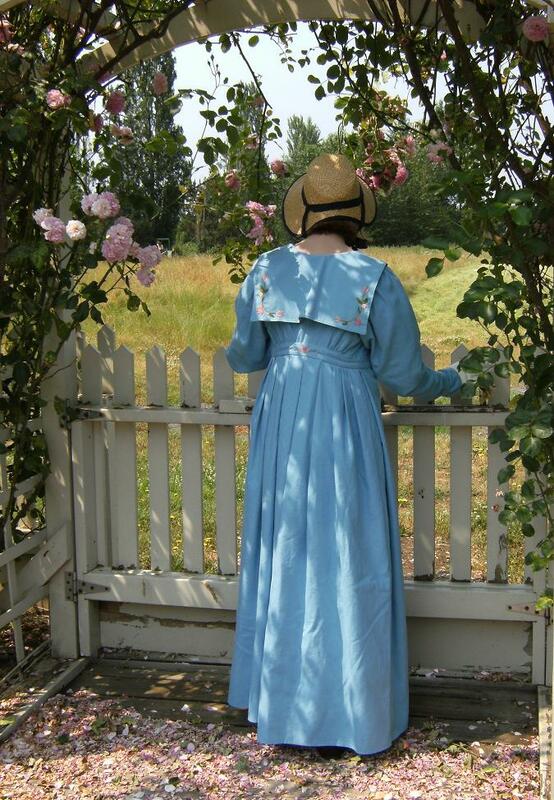 Details are historically inspired and meant to achieve an accurate look for reenactments and events. More details can be seen in the photos below. neckline and sleeves of chemise are cotton drawstring style. stays are fully boned. This costume was inspired by classic Renaissance paintings and historical fashions. Dress color is a deep sage warm green and the full sleeves are a woven blend that has a subtle texture. Gown skirt is is full and gathered to the empire waist bodice. More details can be seen in the photos below. antique lace is accented with golden trim on the bodice design. My customer was looking for a costume inspired by Evelyn's Librarian Costume from 1999 movie "The Mummy". This was a fun style of costume for me to sew. I don't usually get commissions for more modern garments and the vintage style fabrics allowed for lots of details to show in the design. I really wanted to go with fabrics and textiles that captured the look and feel of the original costume while still maintaining a feminine approach. (The striped pattern on the shirt shows up much better in real life. My camera was having a hard time with the contrasting colors) The costume includes a silk chiffon scarf, striped shirt with vintage style buttons and a khaki skirt. Here is a coat I create for a customer who wanted a design in this style and color scheme. She was inspired by some Russian Inspired coats seen in classic books and vintage garments. So this is the look we came up with. Fur is all a high quality faux fur with a rich texture and color. Fabric is a high quality chocolate brown wool. Coat is fully lined with a mid weight bridal satin in deep brown. This makes it perfect for slipping over evening gowns. The back of the coat is draped with a shawl collar like detail in the rich faux fur. More details can be seen in the photos below. The vegan fur collar accented the dark brown wool nicely. This yellow dress is truly a unique garment. It was inspired an original design that a customer sent me for use as an inspiration image. She wanted this custom yellow dress to wear to her wedding. I used layers of yellow chiffon fabric and tied everything together with a bow and puffed sleeves. 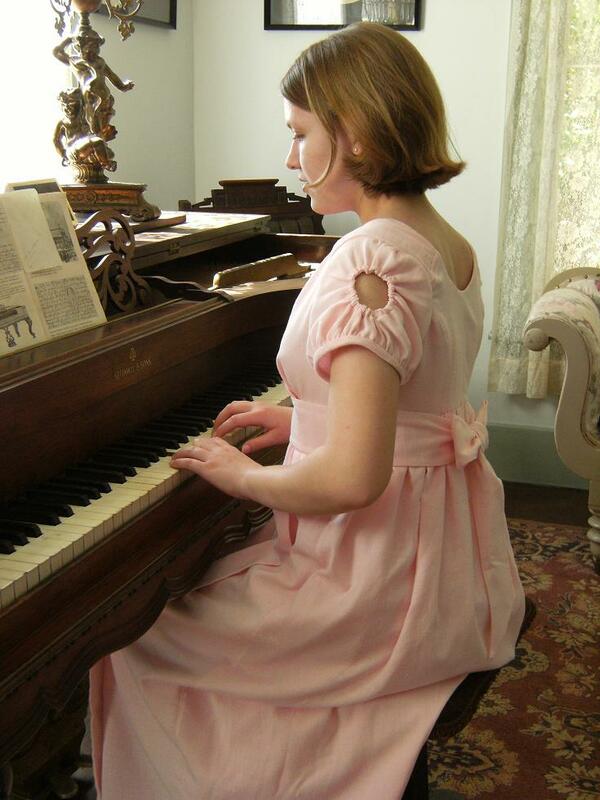 The following dress was inspired by 1860's day dresses and the classic story "Little Women". Dress is made from a wool blend fabric and accented with antique buttons. Skirt is fully pleated and bodice closes up the front. Sleeves are cuffed and feature button closures. 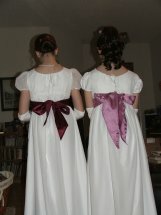 Some of my first costuming projects and commissions were Jane Austen inspired looks. Here are a few of my favorite looks I created for customers. Each dress is a historical style and features unique fabrics. Gown is a lovely brown linen and accented with lots of historical details. Bodice is a flattering ruched style. The following purple gown was created with a matching bonnet. My customer wanted something inspired the BBC series "Cranford" and Regency looks. The following outfit was a custom order for a customer looking for an outfit based upon some antique photos of Apache style outfits. We decided upon the look after studying the photos and drawing inspiration from the time period the photos were taken. Fabrics used were linens and linen blends. The costume was needed for an event at a school. Images below were used as refrence.